Pennsylvania continues to face budget challenges and we need your help. It is critical that elected officials hear from you about the importance of public higher education and supporting Pitt. Pitt Day gives you the chance to meet with your elected officials and make a lasting impact on them. Join alumni, faculty, staff, students, and friends of Pitt to urge legislators to make Pitt a budget priority. 7 a.m.: Transportation departs from the Oakland campus for Harrisburg. 10:30 a.m.: Registration and check-in at the Capitol. 11 a.m. - 3:00 p.m.: Break into groups and meet with legislators to share your Pitt story; optional tours of the Capitol; student career chat; lunch with fellow advocates. 4:15 p.m.: Depart Harrisburg for Oakland campus. We will brief you on talking with your legislators and provide information about Pitt's impact, but you already have all you need to participate: a passion for Pitt! Meeting with your elected officials lets you connect with them on a personal level and it’s fun to advocate with other people who love Pitt as much as you do! 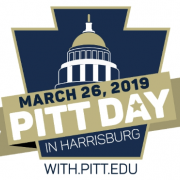 Pitt Day is a time to come together as a community and make our voices heard. Registration for Pitt Day has closed. If you would still like to participate, please email Cassandra Hayt at cassandra.hayt@pitt.edu. This event is hosted by Pitt Advocates, the Pitt Alumni Association, and the Office of Community and Governmental Relations. Contact Cassie Hayt or Shannon Mischler with any questions.